We offer preparation that concentrates on the two areas that represent the greatest challenge for those taking the exam, oral expression and written expression. This preparation has been adapted to the new format of the exam that will take effect in 2018. Since the exam can differ from one profession to another, we offer two distinct programs: one program designed for nurses, doctors and other healthcare professionals and one program designed for social workers, therapists and psychologists. Our first meeting will consist of an evaluation of your knowledge and skills according to the criteria established by the OQLF. Next, we will discuss the results of the evaluation and establish together a realistic plan of action, taking into account your objectives, your level of French and the time that you have to study. At the end of the meeting, you will know what you need to do and the time it will take for you to prepare be ready to pass the exam. We will work with your strengths, taking into account what you already know, and we will provide you with what you are missing in order to pass the exam. The courses are based on three elements: 1. Developing vocabulary to understand a given scenario and to respond to it; 2. Mastering the grammar necessary for responding clearly and; 3. Developing a strategy. These three elements are combined through applied exercises, scenarios, and patient and client histories with which you will be familiar. The knowledge and abilities specific to verbal and/or written expression are highlighted. We are aware that it is not always easy to find the time to study or to travel to attend a course. 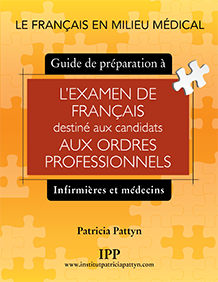 Therefore, we offer various options: classic face-to-face courses at our office or yours, courses via Skype, or autonomous study with on-line support using our Guide (Preparing for the French exam for Health Professional Practice in Québec: A guide for nurses and doctors) that we have written. In conclusion, we believe in a structured, objective-based approach that is adapted to the needs of our students and that is conducted in a respectful and professional mann.